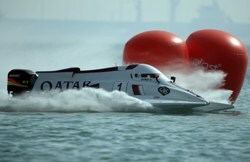 Team Qatar suffered another disappointing outcome to the second Grand Prix of Qatar, round 12 of this year’s UIM F1 World Championship, in Doha Bay on Saturday. World Champion Jay Price was forced out of fourth position on the fourth lap with engine and transmission-related problems, as the second race victory of the weekend fell to pole position winner Guido Cappellini who secured his 61st career win and 100th podium finish. He was pressured throughout by eventual second-placed Italian Francesco Cantando, while Team Abu Dhabi’s Thani Al-Qamzi finished fourth to maintain a three-point lead in the Formula 1 Drivers’ Championship over Cappellini. Qatar’s British second driver, Malcolm Goodman, was unable to repeat the stunning form he showed on Friday and retired from the race on the 20th lap. He had been placed as high as 11th, before being forced to take a drive-through penalty for hitting a buoy. A loose earth wire caused the power steering to fail and cost him the race. Price and Goodman earlier lined up in third and 15th places for the start of twelfth round of the championship. The wind had changed direction by mid-afternoon and Price admitted that caution was a byword on the opening laps. Cappellini was chasing a hundredth career podium finish and he made a good start by forcing Price wide through lap one to hold the lead, as Al-Qamzi slipped into second place and Goodman moved up to 12th. Francesco Cantando managed to squeeze passed Price into third through lap three, but the Qatar Team’s World Champion suffered another miserable afternoon when he ground to a halt on lap four with transmission problems. Cappellini led from Cantando, Al-Qamzi, Chiappe and Selio, with Goodman holding 11th through lap seven. Cantando began to apply the pressure on Cappellini through on the 13th lap although Al-Qamzi, Chiappe and Al-Hameli held station as the race reached the two-thirds mark. Chiappe passed Al-Qamzi into third position and an airborne Cantando stayed on Cappellini’s coat-tails in a thrilling duel in Doha Bay. Goodman maintained 12th overall until lap 20 when he was forced out of the race with a loose earth wire to cap a miserable day for the Qatar Team. Cappellini continued to edge away from Cantando, who was coming under pressure from Chiappe through 28 laps. But the Italian began to cede the time over the closing laps and the gap was down to just 2.39s through lap 32. But the veteran held on to confirm his fourth win of the season and the 61st win of his illustrious career.